SmartLic supplements already help improve forage utilization and reproductive performance by providing cattle the essential nutrients they need. Now, SmartLic NE-22 IGR, NE-Mag 22 IGR, NE-30 IGR and MinLic IGR supplements help keep horn fly populations under control too. 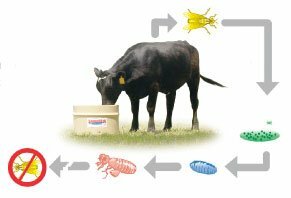 As an insect growth regulator, Altosid passes through cattle and into the manure. This is where the breaking of the fly cycle begins. Female flies lay eggs in fresh manure. Within a week or so the eggs develop into larvae, then pupae and then adult flies. The active ingredient in Altosid, methoprene, ultimately prevents fly eggs from completing this cycle, keeping adult flies from emerging. Kansas State University research completed in 2005 shows that feeding SmartLic IGR supplements fortified with Altosid to cattle significantly decreases the survival rate of horn flies to the adult stage. New Generation Supplements is the only block manufacturer to have its own fly control research. NE-22 IGR, NE-Mag 22 IGR, NE-30 IGR and MinLic IGR supplements contain 0.005% and 0.01% of the active ingredient methoprene respectively. When fed properly these supplements will provide a sufficient amount of insect growth regulating methoprene to prevent the emergence of adult horn flies from the manure of treated cattle. Existing adult horn flies will not be affected. For best results, start feeding NE-22 IGR, NE-Mag 22 IGR, NE-30 IGR and MinLic IGR before the horn fly season starts and continue until cold weather marks the end of the fly season. Altosid Insect Growth Regulator is a registered trademark of Wellmark International. Take control of your fly problems. Break the fly cycle. Feed SmartLic IGR supplements.